If you’ve been active in the media community you’ve undoubtedly heard of virtual reality video, leading many people to believe that it’s the next big thing in the world of film when in reality, it’s the current big thing that everyone’s been talking about. In fact, the newest innovation is 360° video and although they both sound like the same technology, they are actually quite different. When it comes to looking at the photography of both mediums, that is where you’ll see the most significant differences between both VR video and 360° video. In a virtual reality environment, the photography is created digitally, as mentioned it is referred to as a virtual environment, or VE. A team of professionals creates these landscapes, characters, and elements typically within a digital studio and with the help of computers and software programs. In comparison, 360° video is captured from a real-life landscape. These live action videos are not reconstructions of things that you would see in your everyday life, they are real videos in real places that everyone has access to. It’s also interesting to consider the amount of mobility that viewers have when it comes to both types of video, as virtual reality is far more immersive than 360° video. With virtual reality the viewer or player has the ability to walk relatively anywhere and explore further into the landscape. The only thing that may prevent you from venturing too far is if you are tethered to a computer or any other device that is providing you with the artificial landscape. Otherwise, you can easily walk absolutely anywhere while you are immersed in the world. On the other side, a 360° video only gives you a certain amount of viewing power. Since the filmmaker will have full control over the content that you see, viewers will only have the ability to get a full view of what the filmmaker has filmed. The movements of the filmmaker limit the entire viewing field. 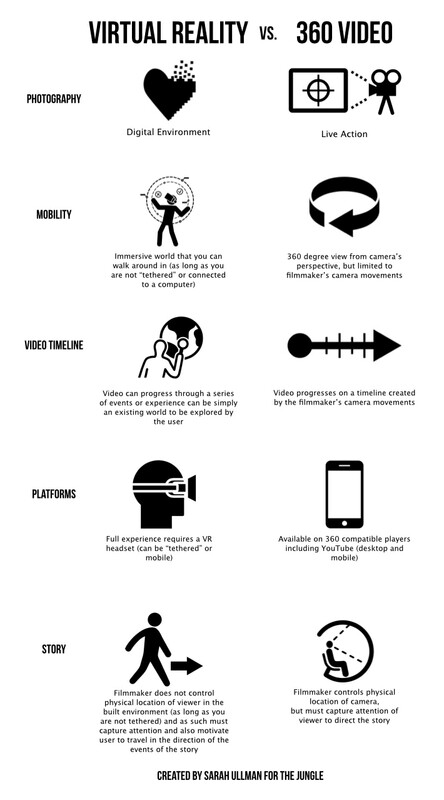 One of the main reasons as to why VR video is so popular amongst video game studios is because they can integrate a vast timeline to keep their players entertained. With virtual reality the timeline could be endless as you can create a series of events or different experiences that exist in a theoretical world. The way that the timeline progresses depends on the actions of the user, whereas with 360° video, the timeline progresses based on what the filmmaker has filmed. When you consider the platforms that are available for both mediums, it can be more cost effective to use 360° video as users can access the video from any device that offers viewing capabilities and that is compatible with 360° videos. For example, they can log onto their computers and visit free websites such as YouTube to watch the video. With virtual reality you have to purchase particular accessories that support the program you’re involved in. Typically these can be quite expensive; Sony is releasing a VR headset for approximately the same price as an entire console. Creating the content and the story for VR is far more in-depth than 360° simply because the filmmaker doesn’t have control over what the viewer sees. You have to ensure that every crevice is designed perfectly to capture the attention of the audience and to impress them. You also have to pay special attention to enticing them to want to immerse themselves more in the environment. It’s equally as important to capture the attention of the viewer with 360° video, though you have full control of what your viewers can see. Overall, both technologies are interesting and have shaped the way that we view content on a regular basis. Virtual reality seems to be a more in-depth technology that allows players to explore a brand new universe, whereas 360° video is great for real-life applications. Virtual Reality videois something that has been discussed everywhere from sci-fi films to video games all over the world. With VR video you are given the ability to immerse yourself in a specific scene that has been created by an animator. It is essentially a way to allow the user to explore a virtual environment in real-time. In comparison to a 360° video, virtual reality is like it name suggests, a reality that has been virtually created for your exploration. If you’re a fan of major YouTube personalities, you’ve undoubtedly seen 360° video before as companies have been developing innovations that allow people to record their daily lives with a 360° view. With a 360° you’re given the opportunity to watch a video from all angles of recording. Meaning that although a person might be recording their face, you can use controls on your device to see to the left, to the right, and even behind the camera. It’s a great way to make the viewer feel like they are actually in the same room as the filming personality.